Tzolk’in Date: 3 Oc. Ruler is White. Blocker is Black. Gatekeeper is Mercury. Both my husband and father are dogs! No kidding. I’ve known this for quite some time. According to the Tzolk’in calendar calculators, both my husband and my father were born on 2 Oc! Certainly this is a very uncanny canine coincidence! LOL. Believe me, when I first discovered this and now as I consider it again, it’s altogether freaky. My husband is nine years older than I am and I used to think he kinda looked like Sean Connery. Yes, I liked that he was an “older man.” Indeed, when I first met him, he was a teacher in my high school and I called him Mr. R.
Freud would probably have a field day with my life’s history; my husband serving as a classic Father Figure. Indeed, the guy has his own way of being very fatherly. When we were deciding what we would raise our two sons to call us, I decided on “Mama” and he decided on “Father.” Not Daddy or Dad, but Father. So, as I was raising my children, I would say….”Father says this and Father’s doing that”…as if he was my Father too. More times than I like to admit, I’ve called my husband, “Daddy” accidentally…and a couple times I’ve also called him “Lucky,” which was my dog’s name, several times….a slip of the tongue, ya know. I don’t have to scratch my fleas for long before coming up with a good number of commonalities in their personalities that reflect the “Oc” in them. They are definitely devoted family men, and were faithful team players, my father, as a doctor; and my husband, as a teacher. Both always went above and beyond the call of duty to help others. So often, when groups of people gather to undertake a project, attend a meeting, whatever— there is too much bickering. Not enough people remain silent and gather wisdom through watchfulness and cooperation! But I think both my husband and my father have been endowed with this talent. In fact, many, many people who have known either my father or my husband professionally have commented as to how steady and amiable and genuinely nice people they were to work with or otherwise interact with. Someone said this to me about my father, just last night…someone who had worked with him 30 years ago. I can just seem my husband and my father wagging their dog tails at people, with their happy tongues hanging out! 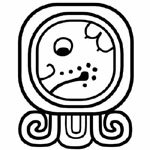 There is always a shadow side to each Tzolk’in glyph’s characteristics but ….I will not hang out the family’s dirty laundry here! But the Tzolkin days signs are meant to be utilized for personal development. And it’s interesting to examine how both the positive and negative energies of a sign manifest in personalities that you know. As each day passes and I journey through the 20 glyphs of the Tzolk’in, I’m learning more and more. We are always in a relationship with our selves and others and the dog, Oc—man’s best friend– can assist us in being, our own best friend and everyone else’s. This entry was posted in Uncategorized, Wellness and Spirituality and tagged Du'TSu, Grandmother Parisha, Mayan, Medicine Wheel, Oprah Winfrey, Pa'Ris'Ha, Wellness and Spirituality, Wellness spirituality. Bookmark the permalink.